Christmas is not around yet, but not for slot providers. They are working hard right now to prepare some Christmas themed slots and one them, which we would discuss today is Jingle Spin by Netent. 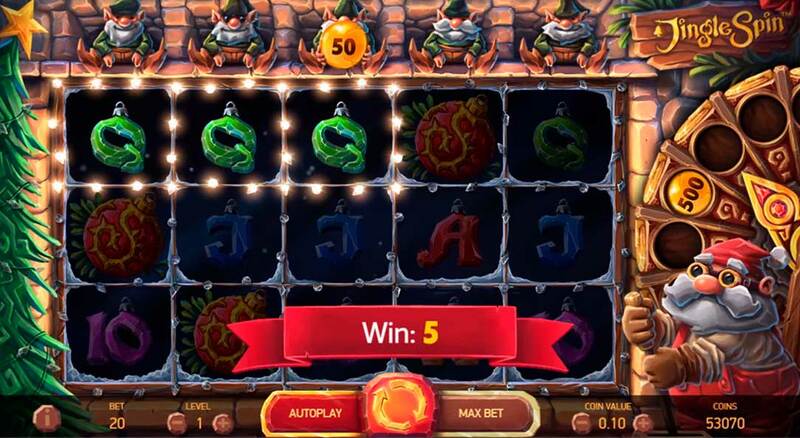 Read our Jingle Spin slot review, to know how to get all the presents for Christmas and don’t fall into Bauble trap. Are you a big fan of Christmas, probably yes. 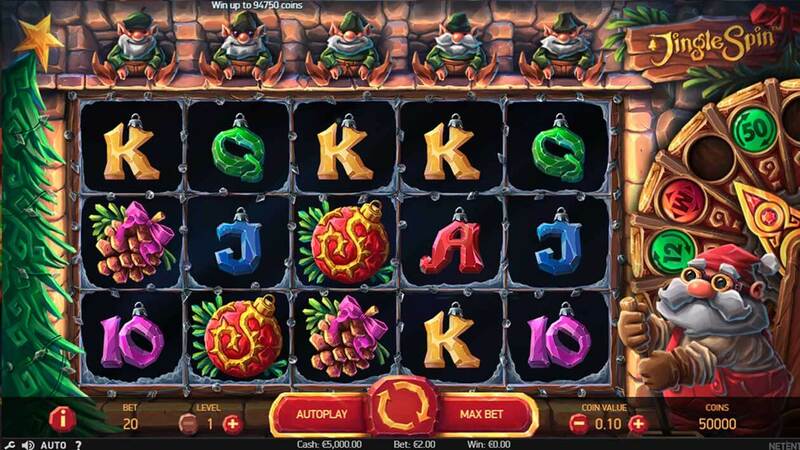 It’s a wonderful time of the year: Christmas trees everywhere, gifts exchange and slots. Yes, that’s right every year slot providers try to impress us with new slots. From the first look, it seems like a trick. Make a Christmas slot with low RTP or weak mechanic, and people still will play it, because it has Santa Claus in it. However, this time Netent company decided to add some Christmas spirit to their old, well-known slot Eggomatic which looks like a smart idea. Don’t get us wrong Jingle Spin seems entirely different, but mechanics is the same. The problem with the Eggomatic slot is that NetEnt refuses to optimise it for all modern devices and leave as a flash version only. If you are a big fan of an Eggomatic mechanic, now you are finally can enjoy almost the same slot on any of your mobile devices, as it comes with full HTML5 support. You can pick any casino from our best mobile online casinos list now and enjoy your slots on the go! Jingle Spin is a regular 5-reel slot with only 20 pay lines. You can select bet size according to your needs, from as minimum as €0.20 to €200 coins per spin. There are 10 symbols, half of them are high paying ones. The best symbol you can get is Christmas ball, it pays ten time your stake. There is also a wild symbol, which can appear on any of the reels. The main feature of this is an extra reel on top of the slot. Each spin you can randomly land an extra bauble there, and if you land wild symbol on the same reel as a bauble, you will crack it open to receive your reward. Once you land your bauble, it moves from fifth reel one position left each spin, so there are 5 chances to catch it. There 4 types of bauble: a coin win bauble, exciting mystery win bauble with maximum win up to 125x stake a wild bauble with the potential to turn nine symbols wild and a free spins bauble up to 50 free spins. In a free spins mode, there is a small difference from the base game. You will start with all 5 baubles on top, and you will get an extra bauble every spin. You can also retrigger your free spins. So it’s all about bauble catching! While the mechanic seems a little bit difficult from our description, it’s much more fun when you see it live. RTP of Jingle Spin slot is 96,5%, it’s a typical number, so it means stable game, nothing special there. Since it’s a medium variance slot, don’t expect super huge wins from it. It’s good enough to try on, but we don’t suggest you stay in for a long time. Maximum win you can get on this slot is 1000 times your stake which is not that big nowadays. The danger of this slot is that you can get a lot of dead spins in a chase of free spins bauble. It works like this: Oh free spins bauble, here we go! Empty spins. Oh, it’s gone now. Oh, here comes another one. More empty spins and it’s gone again. Be careful this is how you lose your money! Play this slot for entertainment and don’t expect a huge win there. It’s a nice addition to Secrets of Christmas, which is a remake of Secret of the stones. We are wonder now which slot we should expect next year, maybe Jack and the Christmas Tree J We are glad that NetEnt decide to use Eggomatic mechanic once again. The problem is that the pay table is still the same and you can only win 1000x maximum. However it’s still a fun slot overall. You can enjoy try slot and many others for real money now. Pick one of our best casinos and use a welcome bonus, to boost your balance and catch more bonues in this new slot.